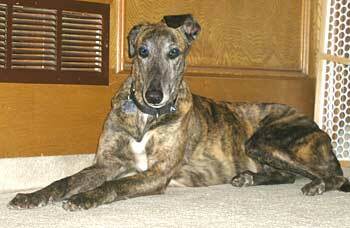 Symbol, aka Wise Symbol, is an Irish born and bred 8-year-old dark brindle female, born March 13, 1999. Her sire is Smooth Rumble and her dam is Wise Memory. 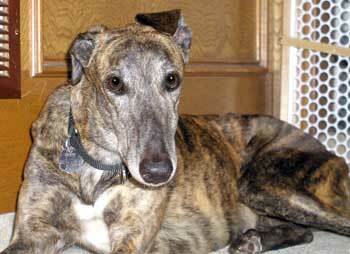 Greyhound-Data shows Symbol had two litters of pups, one in November 2002, when bred to ICU Thunderbolt resulting in 6 pups, and again in October 2003, when she was bred to Angel's Foosball and had 3 pups. Those days are behind her now, and she is ready for her forever home! As you can see from the pictures, Symbol has very interactive ears. When she runs toward you, they stand up and fold over in half, as if they are waving "hello, here I come" to you! Symbol is not cat or small animal tolerant.